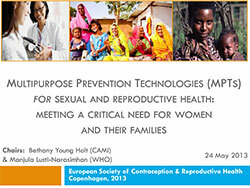 This session discussed the definition of MPTs, the global need among the female population, and the currently available method mix. While MPT development is complex, an examination of key countries demonstrate the benefits for HIV prevention, STI prevention, and contraception. A discussion of the MPT product profiles also led to recommendations for working groups, investment alignment, and product introductions to help advance the field. Rees, H. What are MPTs and why do we need them?